In this blog, you will learn about Triggers in SQL Server and I will explain the concept of triggers with an example in a simple way. In this blog, you will learn about Triggers in SQL Server and I will explain the concept with an example in a simple way. I hope this is very useful for beginners and intermediates to help them understand the basic concept. A trigger is a compiled special kind of stored procedure that executes in response to a certain action on the table like insertion, deletion or updation of data. It is a database object which is bound to a table and is executed automatically. You can’t explicitly invoke triggers. Triggers execute when a user tries to modify data through a DML event. 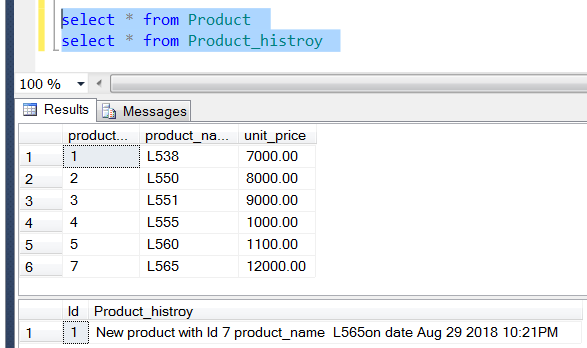 DML events are INSERT, UPDATE, or DELETE statements on a table. A trigger is triggered automatically when an associated DML statement is executed. The Triggers can be defined on the table, view with which the event is associated. The DDL Trigger will execute whenever you will do insert, update, delete and drop operations. DML Trigger is fired automatically in the response of DML statements INSERT, UPDATE, DELETE statements. In this blog, we will discuss DML Triggers with examples. Let’s say, the price of product changes constantly, it is important to maintain the history of the prices of products. 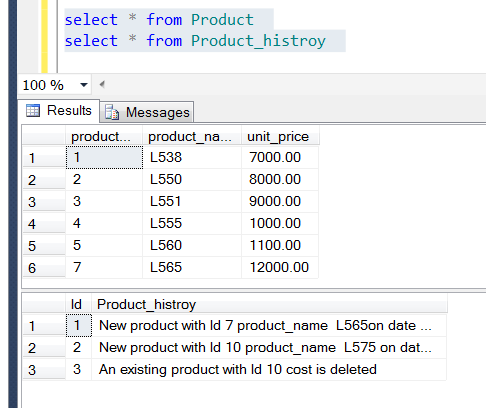 Here, we are going to create two tables first Product and second Product_history. Now, insert the some records in the below table. We are going to create a trigger on the insert, update, delete DML actions and the product price history. It should be updated when the price of the product is inserted, updated and deleted in the product table. Let’s have look at after insert trigger below. 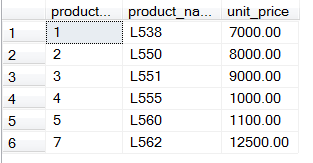 We are going to write the trigger on Product and whenever a new model gets launched or the old model's price is updated or the old vehicle model is deleted from the table then it has some record in another table ‘Product_History’. We have used ‘Product_History’ table for the same purpose. In the above trigger, we have selected the column value from the ‘inserted’ table, this table is nothing but a temporary table, whenever you do any insert operation intermittent in trigger only we can select the values and do the required operation as per your requirement. Execute the below code to check if the records are affected or not in the below tables. If you wanted to do some changes in the above trigger use ALTER command and do the respective changes as per the project requirement. An after update trigger is called immediately whenever any type of update operation is done on a table. Now we are going to create update trigger for update operation like below. If you want to print any message in trigger then you can use PRINT command. Execute the below snippet code to update the price and name of the product. There are some situations where we need to delete the vehicle model form product table and need deleted model information in the product history table regarding which record has been deleted on which date. We are here going to create Product_Delete trigger. We have the below records. Now we are here going to delete the record for executing the below statement. One record is deleted from the table -- see the output which records what's been deleted and added in the product history table. Now, let us see where it fires instead of triggering an action. The insert, update, and delete statements cause an error instead of statement execution. We can’t actually insert the row, instead we have to instruct another way to insert the record. For example, we are going to add one more table called customer who booked or purchased the car. Execute the below script to create and add some records in it. We will have a look at the syntax and implementation of the instead of trigger now. 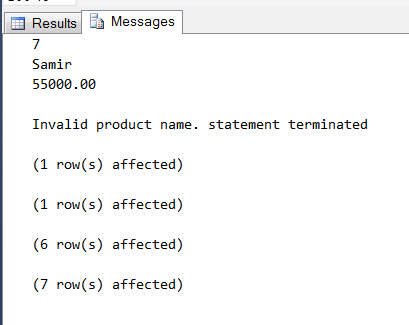 As we know, insert statements affects multiple based tables, then SQL server through the error. We will see this scenario with an example. We have two tables; the first one is product and the second one is customer. 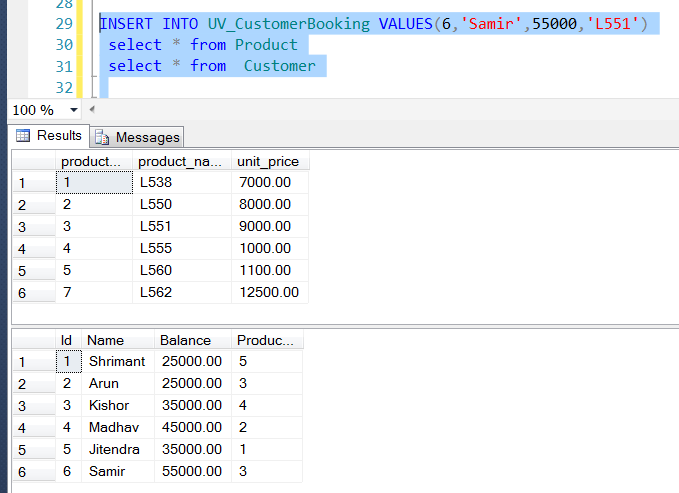 Now we are going to create the view to check if the insert statement affects multiple based tables then SQL server through the error. Let’s say from the customer table we want id, name, balance; and from the product table, we want product_Name to create the view like below. Basically, instead of inserting records on multiple tables, in this situation, we can use Instead of triggers. Now we are going to create instead of trigger in view. In above ‘UTrig_CustomerBooking’, Inserted table contains newly added data. Deleted table contains old data. But here we didn’t delete any row, so the then output is like below. 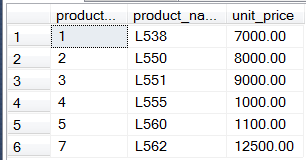 As it seems in output, from the inserted magic table we are selecting Id, Name, Balance and ‘L540’ vehicle model or product name. We have to query the product name on the product table and get the product id like below. We are trying to insert the record and this record will be inserted like below. Now again, we are inserting a record but passing the wrong vehicle model, for the same execute the script below. 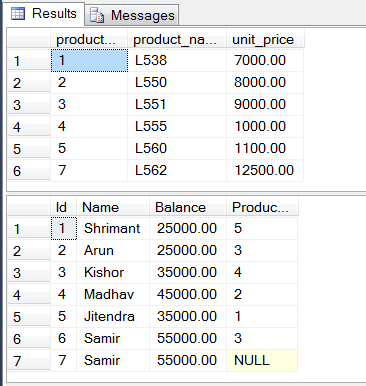 Messages are showing that ‘Product Id’ got null and are showing a message as ‘Invalid product name, statement terminated’ and inserted values Id, Name, Balance in the customer table, one new row was inserted from customer table and six rows were selected from the product table and seven rows were selected from the customer table. 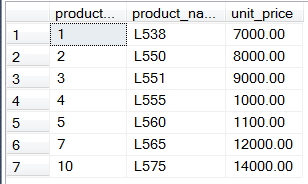 Wrong vehicle model does not exist in the table and it stores the value as Null. The Triggers fire implicitly while Stored Procedures fire explicitly. In this blog, I gave a brief introduction of triggers, explained the various kinds of triggers – After Triggers and Instead of Triggers -- along with their variants and explained how each of them works. I hope you will get a clear understanding of the Triggers in SQL Server and their usage.